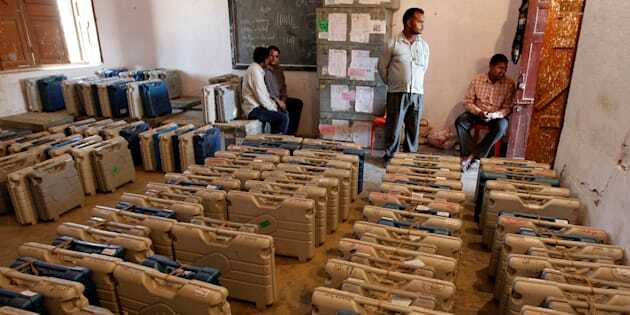 New Delhi: The Election Commission has put in place an elaborate framework of administrative system, security protocols and procedural checks-and-balances in Gujarat, which prevent any possible misuse of EVMs/VVPATs or procedural lapses in the use of EVMs and VVPATs during polls. These safeguards are being implemented by ECI, in total transparently, with the active and documented involvement of Political Parties, Candidates and their Representatives at every stage, so as to build their confidence on efficacy and reliability of EVMs and VVPATs. All these functions and procedures are implemented through the District Election Officers (DEOs), Returning Officers (ROs), Assistant Returning Officers (AROs) and other election related officers concerned, who are on deemed deputation to the ECI and are under its superintendence, direction and control. i. Manufacturers certify at the time of FLC that all components in the EVM are original. After this, the plastic cabinet of Control Unit of the EVM is sealed, which is also signed by representatives of political parties and stored in strong rooms. After this stage, the plastic cabinet of control unit of the EVMs cannot be opened. ii. Mock poll with a few votes is conducted on every functioning EVM at the time of FLC. Additionally, at the time of FLC, 1200 votes were cast in 1% of EVMs, 1000 votes in 2% and 500 votes in another 2% of EVMs in the presence of the representatives of political parties. A printout of the results of this mock poll as well as a sequential print out of every vote polled during the mock poll were shown to the representatives of political parties. Representatives of political parties were allowed to pick machines randomly for this purpose. In rest of the machines, numbers of votes polled during the mock poll were to the satisfaction of the representatives of political parties. Representatives of political parties were allowed to do mock poll themselves. In VVPATs, mock-poll with 6 votes against each of the 16 candidate buttons was done for each VVPATs. i The strong rooms will have double lock system. One key will be kept with District Election Officer and the other with Returning Officer of concerned assembly constituency. ii Two cordoned security arrangements will be made round the clock for the strong rooms having polled EVMs and VVPATs kept for counting of votes. The CPF will man the innermost perimeter security immediately outside the strong room and the State Armed Police will man the outermost perimeter security. iii All contesting candidates will be intimated in writing to depute their representatives to keep a close watch on security arrangement of strong room. They will be allowed to stay outside the inner perimeter at a location, which enables them to view the entry points of the strong room. As far as possible, facilities such as proper shade, drinking water, etc. shall be provided to them. If there is no direct view to the entry point of the strong room, CCTV is arranged at such location, from where they can see the strong room door on CCTV. In such a case, they will also be taken periodically to the inner perimeter in batches, to see, verify and satisfy themselves regarding the security of strong room. The CCTV display of Strong Room will be arranged on a large TV screen at the place earmarked for the representatives of Political Parties and agents of the candidates, so that they can continuously monitor the Strong Room. iv A control room adjacent to the strong room will be operated round the clock. v A Gazetted officer along with a senior police officer will be put on duty round the clock for monitoring the security arrangements of strong room. a) The log book will be maintained by the CPF in which entry should be made about date, time, duration and name(s) of person(s) crossing the second security ring i.e. the middle perimeter. This includes visits by the Observers or DEOs or SPs or candidates or their agents or any other person. b) Video cameras will be provided to the CPF contingent to record all visits made by such visitors. vii All the entry points (doors etc.) of strong rooms will be under constant videography using the web-cams and laptops available. If there are other doors of the strong room, they will also be covered by the web-cams/videography. Persons coming to take back-up from the laptops should have identity cards given to them and their names should be recorded in advance with the CPF contingent stationed there. Their visits will be videographed by the CPF contingent with the video camera provided, for the entire duration. viii Returning Officers should visit the storage campus (upto the inner perimeter only) every day in the morning and evening and check the log book and videography and send a report to the DEO on the status every day. In case of strong rooms located in the district headquarters, the DEO should do the same. Where the strong rooms are situated outside the District Headquarters, DEO should visit the same as frequently as possible and at least once in 3 to 4 days. ix No vehicle, including that of any official or ministers or any other political functionary, will be allowed inside the secured campus where the EVMs and VVPATs are stored. Alighting point for the vehicles should be marked clearly ahead of the outer security perimeter itself beyond it, it should be a pedestrian zone only. x DCs and SPs will be personally responsible for security of strong room within the district and meticulous implementation of the protocol.